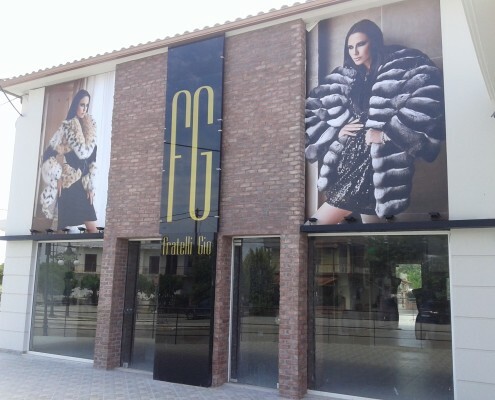 FRATELLI GIO fur store in Pirgos, near the Aldemar Olympian Village Hotel, is one of the newest fur stores in Peloponnese. A magnificent mink fur coat collection and some of the best Blackglama furs in southern Greece are offered at the fur showroom of FRATELLI GIO. The sable furs Collection and lynx fur coats made in Kastoria by SOULIS FURS are some of the magnificent fur types exhibited in FRATELLI GIO. The Pirgos fur store near Aldemar Olympian Village Hotel also carries beautiful chinchilla fur coats made of the best chinchilla skins offered every year. Fox and Swakara fur garments a well as fur accessories are available. It is certain that lovers of fur will find their favorite fur coat whatever fur type they love. From Pirgos : On the crossroad of the 9th Kilometer of the National Road Pirgos – Patra turn right towards Chanakia . After 900 metres on the right is located furs boutique Fratelli Gio . From hotel Aldemar Olympian Village : Going for Pirgos after 3.7 km you enter Chanakia and on the left is located furs Boutique Fratelli Gio.